Famous Surrealist Salvador Dalí was known for his eccentric personality, gravity-defying mustache, and groundbreaking art. Yet one aspect of his career that often gets overlooked is his prolific work as a book illustrator. Few people realize that the same man who painted “Persistence of Memory” also created some rather mind-blowing illustrations for everything from Shakespeare plays to classic children’s novels. If you’re interested in seeing how Dali’s unique mind interpreted some of literature’s greatest works, here are five examples from Dalí’s underrated career as an illustrator. 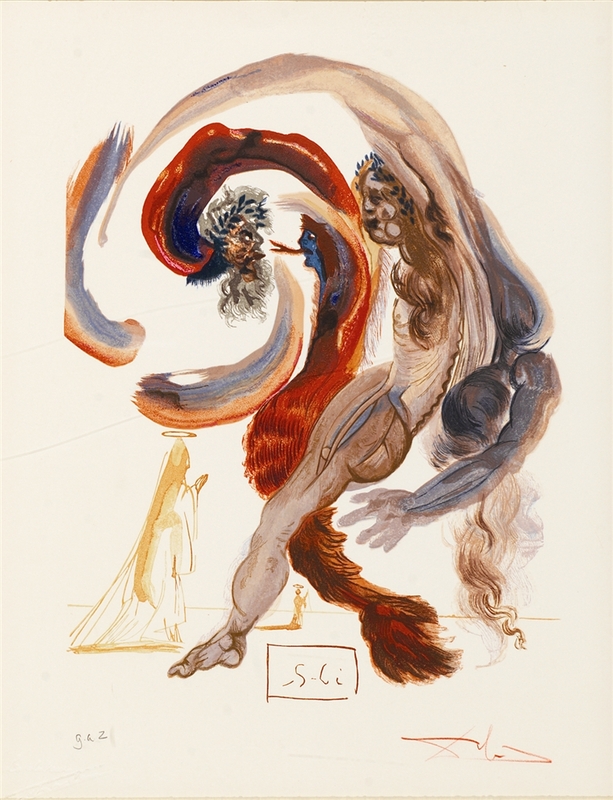 Shakespeare’s famous “Macbeth” has a trio of witches, apparitions, murder—basically, it sounds perfect for Dali. Dalí agreed, creating 12 black-and-white illustrations for a 1946 reprint of the play by Doubleday & Company. The impressive cover features an intricate pattern that appears to be the letters of Dalí’s name layered over one another. A Spanish language reprint of this book was published in 2006. 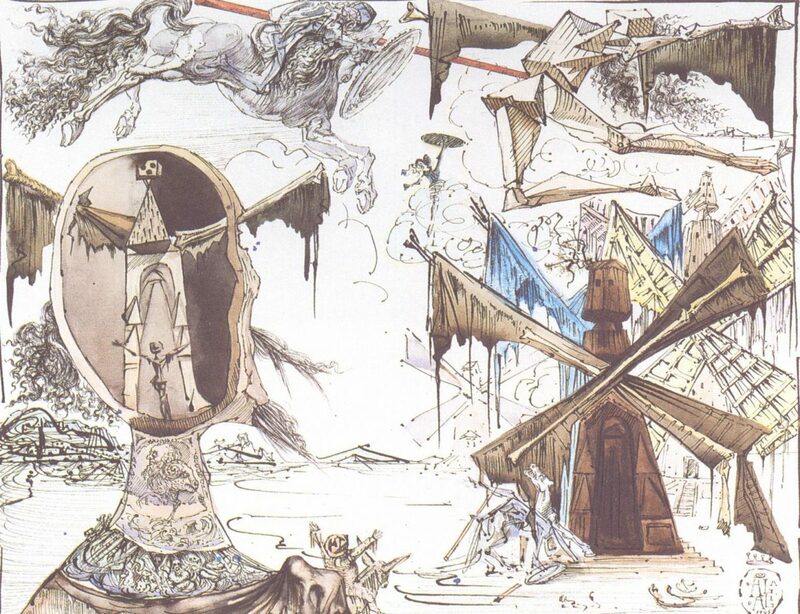 Dalí took on the literary classic Don Quixote for a 1946 English edition published by Random House. As a Spaniard, it was only fitting for Dalí to apply his talents to illustrating one of the most beloved Spanish novels of all time. Dalí’s elegant take on the story resulted in a combination of black-and-white sketches and 10 watercolors, ranging from scribbled depictions of Don Quixote on horseback to detailed, surreal landscapes. The book was reprinted in 1979. In the 1950s, the Italian government wanted to celebrate the 700th anniversary of the birth of Dante, Italy’s most famous poet. They decided to commission Dalí to illustrate a commemorative edition of Dante’s epic poem, “The Divine Comedy.” The government later rescinded their commission, but Dalí completed the project anyway with French publisher Les Heures Claires. 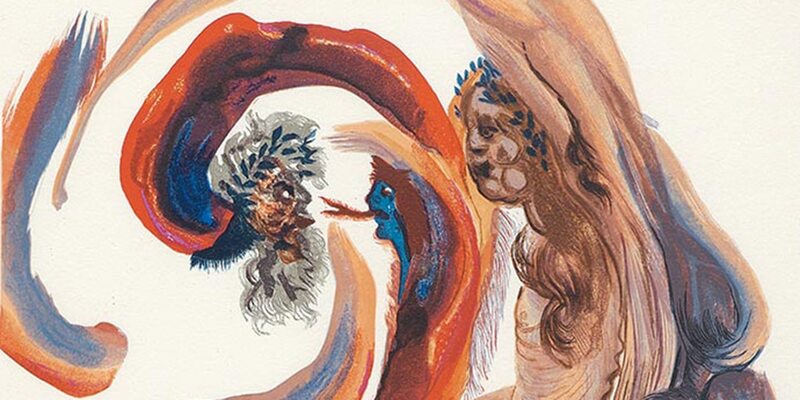 Dalí created 100 watercolor paintings based on Dante’s poem about Heaven, Hell, and the Afterlife. 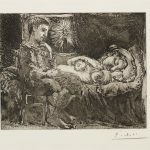 Under his supervision, his paintings were transformed into a series of engravings. The process was labor intensive but resulted in magnificent works. 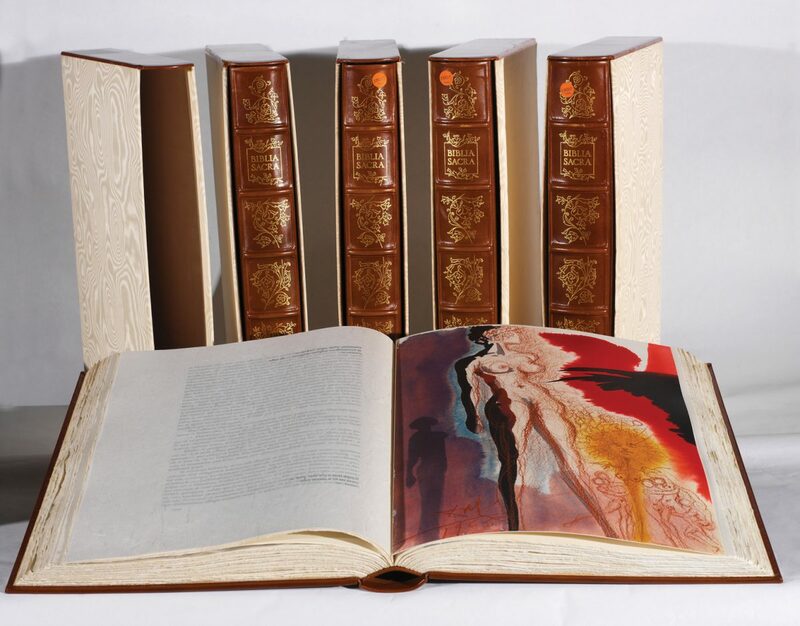 The Dalí-illustrated edition of “The Divine Comedy” was published and distributed in 1963, with editions printed in French, Italian, and German. The Holy Bible has been a source of artistic inspiration for centuries, from Leonardo da Vinci’s “The Last Supper” to Marc Chagall’s Bible etchings. In 1963, Dalí followed in the footsteps of his predecessors. 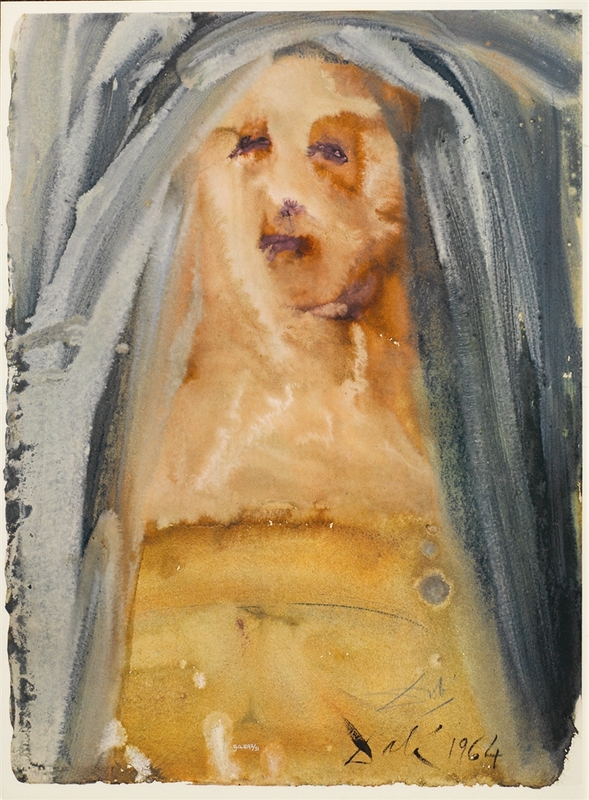 “Plange, virgo, accincta sacco” (“Lament, virgin, girded with sackcloth,” 1964). 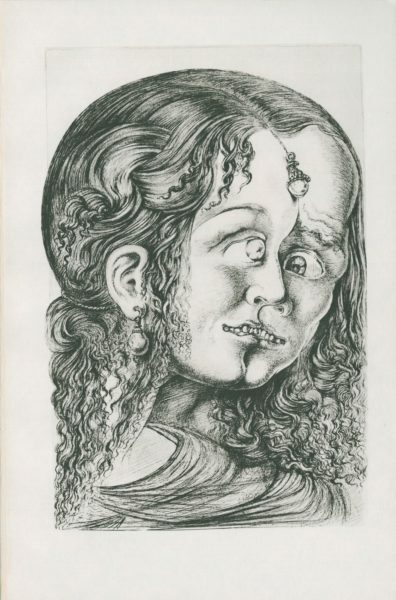 Lithograph from Salvador Dali’s Biblia Sacra series. 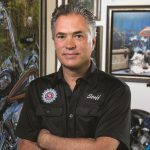 Dalí’s friend, Dr. Giuseppe Albaretto, commissioned Dalí to illustrate the Bible as a way of having the artist gain a deeper understanding of his own faith. Dalí accepted and, from 1963 to 1964, created 105 watercolors depicting scenes from the Old and New Testaments. Renowned book publisher Rizzoli of Mediolani, Italy published nearly 1,800 volumes of the series in 1967, calling it La Biblia Sacra (the Sacred Bible). Some lithographs were released as unbound portfolios without text. Rizzoli developed a specially fabricated paper in order to capture the multiple color impressions and intricate details of Dali’s paintings. The Vatican gave its official Seal of Approval of the “Sacred Bible,” and Dalí even received a thank-you letter from the Secretary of the State of the Vatican. The absurd adventures of “Alice in Wonderland” seem like an ideal pairing with Dalí. No wonder Maecenas Press-Random House hired the artist to illustrate their 1969 version of Carroll’s children’s classic. 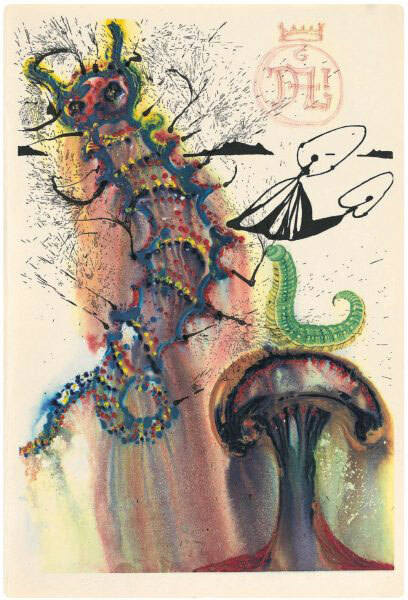 For his “Alice,” Dalí created 12 vivid paintings using a mix of gouache and ink along with a four-color etching that serves as the frontispiece. In 2015, Princeton University Press reissued a 150th-anniversary edition featuring Dalí’s illustrations. Instead of typical printmaking processes, Dalí opted to use the photogravure process (known by its French name heliogravures). This involves coating a copper plate with a specially-prepared photographic image. Once coated, the surface is etched, resulting in highly detailed tones. By the time his career ended, Dalí had illustrated more than 100 books, using his offbeat sensibilities to adapt and expand upon some of the most famous books ever published. These illustrations are a significant part of Dali’s artistic legacy and are definitely worth seeking out. Artwork from some of Dalí’s illustrative career is available to collect, including editions from his Divine Comedy series. Contact our gallery consultants at (800) 521-9654 ext. 4 or sales@parkwestgallery.com for more information.